While most Hard Drive manufacturers are focusing on improving performance, reducing power consumption, and increasing capacity, Seagate is taking a new direction. The aforementioned features are vital, however Seagate is also hoping to bring in a new level of interoperability for port connectivity and operating system compatibility. Their new consumer-friendly line of FreeAgent GoFlex hard drives offer optional interchangeable cables to enable USB 3.0, eSATA, and FireWire support in addition to the current USB 2.0 standard. In addition, all GoFlex hard disk drives are compatible with both Windows and Macintosh platforms. In addition to new hard drives, Seagate’s new lineup of products includes TV media player and home network-enabled accessories. Seagate is jumping into the living room with their new storage-focused media player. Instead of including a built-in hard drive space that wouldn’t be upgradable, the GoFlex TV HD has a slot to dock a GoFlex ultra-portable drive. There are also two additional USB ports for connecting Flip cameras or other storage devices. Seagate also includes a remote control to let users browse through their music, movies, and photos in a high-definition 1080p interface. In addition, the media player includes built-in Ethernet and support for an optional WiFi adapter to enable streaming digital content from home network storage or online services such as Netflix or YouTube. Although making it into the living room was a big step, it wasn’t enough for Seagate. They also rolled out the GoFlex Net which turns the GoFlex ultra-portable drive or any USB enabled storage device into a media sharing device. Their software offers consumers the ability to access content from a PC, iPad, iPhone, Android, BlackBerry, or any device with an internet connection and a basic web browser. To further increase online presence, all GoFlex Net services are tightly inter-nit with social networking sites such as Facebook and Twitter. There’s even RSS feeds for tech-savvy users. It’s also completely compatible with the GoFlex TV HD media player. 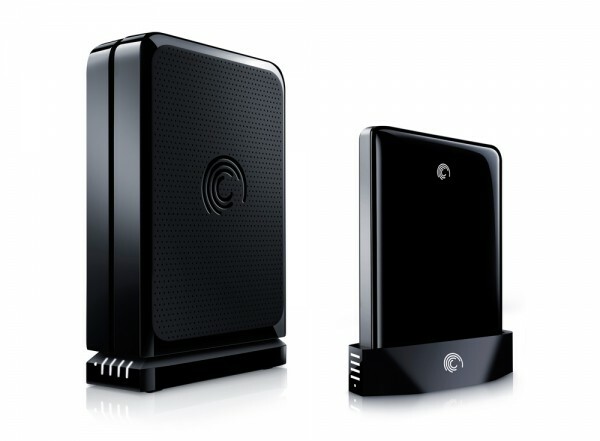 Seagate offers two versions of their ultra-portable lineup: the GoFlex and the GoFlex Pro. The GoFlex is available in 320GB, 500GB, 750GB, and 1TB capacities in silver, black, red, and blue paint jobs. On the other hand, the GoFlex Pro only comes in 500GB and 750GB capacities with only a black coat. 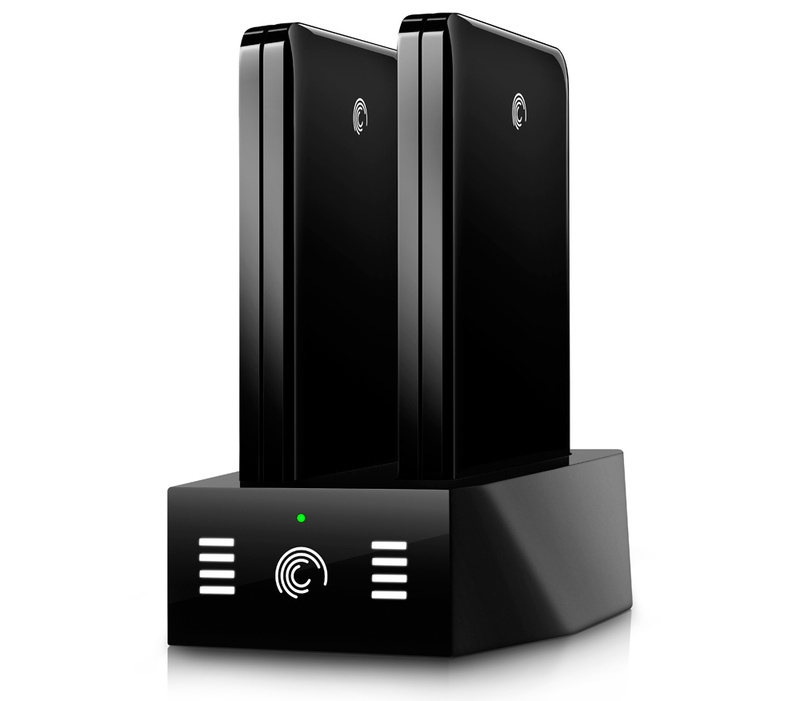 The ‘Pro’ version gets a boost to a 7200RPM HDD for faster data transfer speeds, a GoFlex dock, and premium backup software. Both versions offer data encryption. There’s also the GoFlex Desk, a traditional external hard drive. 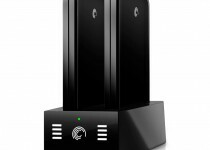 This model is offered in 1TB and 2TB capacities in a black coat and with continuous backup support and encryption. The GoFlex Desk can also be oriented horizontally and vertical for different desk environments. While it may sound like Seagate is trying to increase compatibility and bring flexibility to their hard drives, there’s a larger issue. All their drives feature a proprietary Seagate connector. There’s no slots on the back for USB 2.0/3.0, eSATA, FireWire, or anything else that’s standard. All their GoFlex drives are offered in two versions: a kit that includes a USB cable adapter and drive-only model that is slightly cheaper, but also completely useless without purchasing their cable accessories. In my opinion this isn’t a step forward, but rather a step back. It’s especially a problem because since it’s a Seagate-only accessory, they can markup prices on cables and adapters. The gouging of prices is already visible by examining the MSRP for these gadgets. For instance, the drive-only 320GB GoFlex goes for $89 while the kit version that includes the USB cable costs $99. However, if you were to purchase the USB 2.0 or eSATA cable separately, it’s priced at $20. The USB 3.0 and FireWire 800 cables are priced at $30 and $40, respectively. The entire “versatility” features needs to be an add-on for success, not a requirement. Considering that the base price for these hard drives aren’t any cheaper than their own FreeAgent drives or other competing products, it’s likely going to be an unnecessary expenditure. As the majority of consumers are still on USB 2.0, it’s simply cheaper to grab an external storage solution that features a standard USB port on the back. While I haven’t actually tried or tested these new GoFlex drives, the initial impressions from pure feature-set analysis is somewhat disappointing. While the new style and enclosures make a bold statement and are a fresh design, the introduction of proprietary adapters to support standardized connectivity ports is disturbing. We’ll try to get our hands on these new models for further analysis, so stay tuned for a full in-depth review.